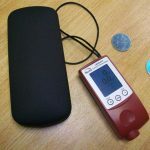 The ‘Dual’ type coating thickness gauge combines two probes in one meter and automatically identifies the substrate materials. Depending on the substrate, the symbol ‘Fe’ or ‘NFe’ is displayed on the screen. The ‘Non-Ferrous’ type coating thickness gauge is for use on non-conductive coatings on non-ferrous metals, e.g. paint, enamel, plastics on aluminium or brass or zinc and anodic coating on aluminium. The symbol ‘NFe’ is displayed on the screen. The ‘Ferrous’ type coating thickness gauge is ideal for use on non-magnetic coatings on ferromagnetic substrates, e.g. zinc, chromium, copper, tin, or paint, plastics, enamel on iron or steel. The symbol ‘Fe’ is displayed on the screen.